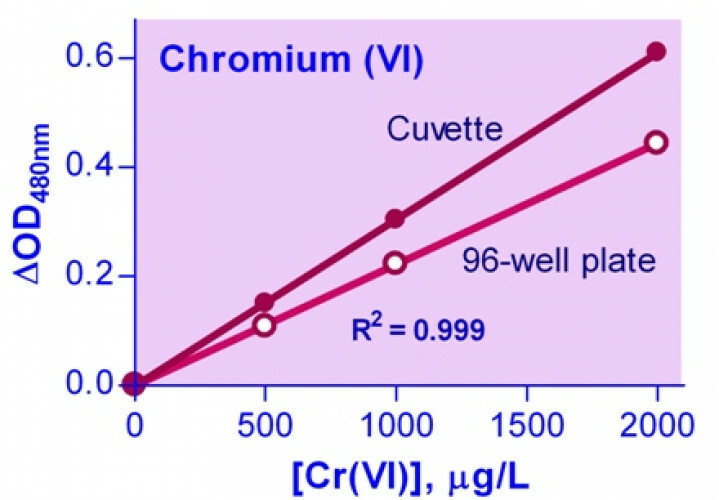 For quantitative determination of chromium Cr(VI). • Sensitive and accurate. Linear detection range of 20 - 2000 μg/L Chromium. • Convenient and high-throughput. Homogeneous "mix-incubate-measure" type assay. No wash and reagent transfer steps are involved. Can be readily automated for processing thousands of samples per day. CHROMIUM is widely used in various industries such as electroplating, leather tanning, chrome paint, dying, hardened steel, ceramic and glass industry. 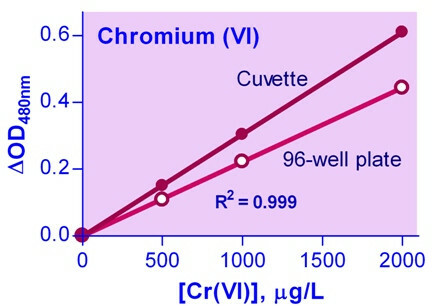 Chromium exists in two stable oxidation states, hexavalent Cr(VI) and trivalent Cr(III). Cr(VI) is produced solely by industrial processes, whereas in nature, chromium exists in its trivalent form. Cr(III) is generally regarded as nontoxic due to poor absorption. Cr(VI) is considered a pulmonary carcinogen and has tested positive in genotoxicity tests. It is one of the most serious pollutants in many water streams due to its carcinogenic potential. Most countries apply a legal limit of 50-100 μg/L Cr in drinking water. BioAssay Systems’ Chromium Assay Kit provides a simple one-step colorimetric means to directly measure Cr(VI) in a sample. In the assay, Cr(VI) forms a stable complex with a specific chromogenic dye. The optical density at 480nm is directly proportionate to the Cr(VI) concentration in the sample. Cr(III) can be converted to Cr(VI) with nitric acid/hydrochloric acid, thus allowing the determination of Cr(III) or total Cr [Cr(III) + Cr(VI)] in the sample. The assay is sensitive with a detection limit of 20 μg/L Cr. Applications For quantitative determination of chromium Cr(VI).